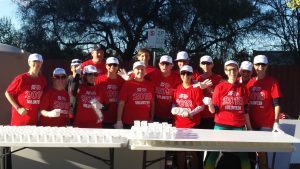 Medibank Melbourne Marathon 2018 – Drink Station #11. 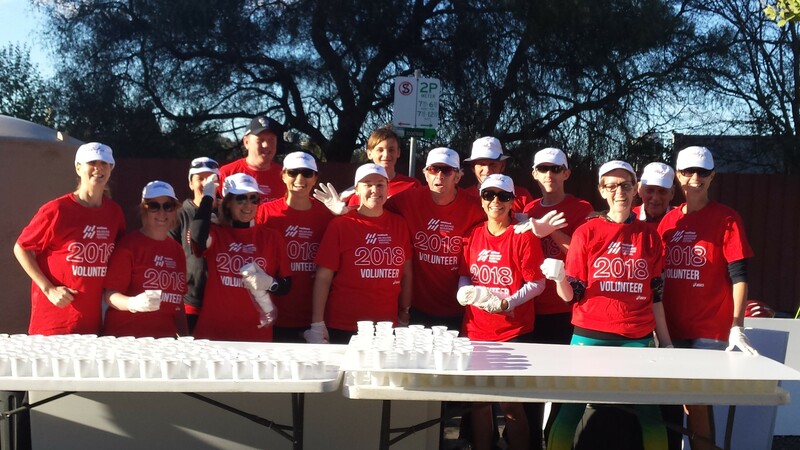 Fifteen volunteers from Aths Essendon – the red and black team enjoyed an early start to our Sunday morning arriving around 7.30am at our drink station #11 on Wellington Parade. A warm but windy 27C was forecast for the Medibank Melbourne Marathon Festival day with record numbers of runners taking part. Our truckie = Luke kindly set up the tables and unpacked all the truck when he arrived around 5am. Once we all received our cap and t-shirt, all 15 volunteers frantically stacked the cups of water and endure on the 14 tables we had. A lovely lady from St Johns Ambulance who was based at our drink station took our team photo before the first runner raced past our drink station. The team included many who were first timers and some with more than 10 years plus drink station volunteering. The team included Arthur Whitchell, Duncan Knox, Christian Knox, Brian Anderson, Judy Tweddle, Jenny Wood, Lisa Gunn, Danny Hawksworth, Glenda Morris, Amelie O’Reilly, Mel Hardiman, Sarah Keating, Yuriria Almaraz, Samantha Grutteria and Matthew Goodger. In keeping with a long standing tradition Arthur kindly brought some very welcome refreshments for us of tea, hot water and milk for us, Sarah supplied the lovely bag of lollies and Judy the home made biscuits. The challenge for all volunteers was to keep the cups of water and endure on the tables as the wind picked up and constantly changed directions. Many of the tables and Corfu sheets were held down by the volunteers. Even then, we could only laugh, as notwithstanding our best efforts, Mother Nature sought to tease as with the occasional very strong gust of wind sometimes dispatching a layer of filled cups from the table sending our cups flying to the other side of the road. Just after 9am the first of the runners appeared at the top of Wellington Parade and when the runner got closer to drink station #11, the whole team of volunteers erupted into loud cheers as it was one of our own red and black team mates – Liam Adams. This set our volunteers up for loud cheers for all fellow runners who passed our drink station. I hope Yuriria had a voice on Monday as cheered loudly all morning, willing all runners to keep going. The first women – Sinead Diver ran past our drink station and went on to break the break the female record. By 1.30pm all runners had passed through our drink station and we were given the all clear to pack up. Gathering up the cups was a challenge as the wind blew the cups from one side of the road to the other side and back again. The day went fast and all volunteers enjoyed cheering on the runners. Amelia even managed to run the 5KM event in between volunteering at drink station #11. I extend my heart – felt thanks to our wonderful team of volunteers. All volunteers stepped into their roles with wonderful enthusiasm. Our roving cleaners, Arthur, Brian, Duncan and others including a Tibetan man who helped as worked tirelessly throughout the day to retrieve the thousands of discarded cups from the street, in spite of the swirling wind, by the end of the day every cup had been collected and binned. BRAVO! Also a big thank you to those runners who expressed their appreciation for our drink station support as they flew past. PrevPrevious ArticleMelbourne Marathon Festival – Club report.